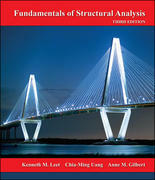 Fundamentals of Structural Analysis 4 Edition Fundamentals of Structural Analysis fourth edition, introduces engineering and architectural students to the basic techniques for analyzing the most common structural elements, including beams, trusses, frames, cables, and arches. The text covers the classical methods of analysis for determinate and indeterminate structures, and provides an introduction to the matrix formulation on which computer analysis is based. This edition features an expanded treatment of snow, earthquake, and wind loads that are part of the updated ANSI/ASCE 7 standards. We've also added Historical Notes to this addition that provide valuable insights to the development of today's techniques and practices. Additionally, about 30% of the text's problems are new or heavily revised.